The new Illustris model, constructed by researchers at several institutions, including MIT, simulates 13 billion years of cosmic evolution, and has generated a new degree of fidelity for certain observed features of the universe. These features include the frequency with which galaxies of different shapes occur in the universe, as well as the preponderance of certain elements in space. "With this model, we are able to get agreement with observational data on small scales and large scales," says Mark Vogelsberger, an assistant professor of physics at MIT and first author of a new paper in the journal Nature that describes the modeling effort. While modeling 41,416 galaxies in all, the simulation closely matches the rate at which certain types of galaxies develop across the universe as a whole. "Some galaxies are more elliptical and some are more like the Milky Way, [spiral] disc-type galaxies," Vogelsberger explains. "There is a certain ratio in the universe. We get the ratio right. That was not achieved before." In another area, the model predicts that supernovas, among other phenomena, have helped redistribute matter throughout the universe to a degree that affects the interpretation of future precision tests of cosmology conducted by space-based telescopes, such as NASA's WFIRST survey, and EUCLID, the European Space Agency's program. Such predictions are one of the benefits of refining models: When researchers construct models that are accurate in several known respects, those models provide a platform for related new predictions as well. The model represents a cube-shaped piece of the universe that is 350 million light-years long on each side. Yet it also produces features at a much smaller scale, just 1,000 light-years. The model's initial conditions represent those of the universe when it was 12 million years old, and then simulates the next 13.8 billion years of change in the cosmos. The model contains 12 billion visual "resolution elements," and includes so much data that it had to be run over a span of months at multiple computing centers. The resolution elements mean that the researchers could create visual pictures from the simulation, and compare those to the visual images of the known universe. "You can take a virtual Hubble Space Telescope and look through the simulation, as it were," Vogelsberger says. Among other features of cosmic evolution whose descriptions conform closely to empirical evidence, the model accurately describes the richness of neutral hydrogen as a function of the stellar mass of galaxies. While Vogelsberger believes the simulation worked well—"The model is more successful than we anticipated," he says—he recognizes that it also has room for improvement. 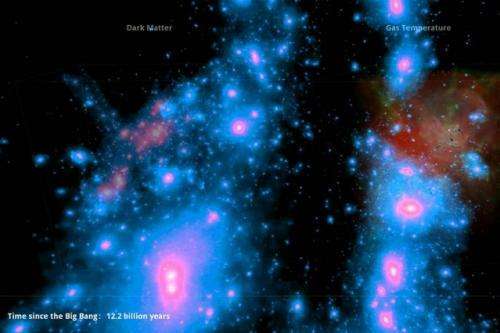 For one thing, "Low-mass galaxies just form too early in the simulation," Vogelsberger says. And while the size of the simulation makes it impractical to quickly test adjustments to the model, Vogelsberger says he and his colleagues are mindful of ways in which it might be refined. Other scientists working in this area say the model represents a step forward for the field. "For the past two decades, cosmologists have been unable to produce galaxies like the Milky Way in their simulations," says David Spergel, a professor of astronomy at Princeton University. "We have long debated whether this failure was due to complex dark matter physics, unknown stellar feedbacks, or the difficulties in simulating the highly non-linear multi-scale process of galaxy formation … With their simulations, [the researchers] finally produce galaxies that look like our own." In the future, suggests Spergel, "The success of these simulations will enable much more detailed comparisons between observations of the distribution of stars and dark matter in the Milky Way and observations."